If you’ve experienced burns and scalds caused by a hot drink, Advice.co.uk can help you to get the compensation you rightly deserve. We have years of experience in the industry and we have helped many people to get the payout they are entitled to. You can give us a call on 0161 696 9685 today, but first, continue reading for all of the advice and assistance you need. What Can I Claim For Aside From My Burn Or Scald Injury? What Are The Most Popular Hot Drinks In The UK? What Are The Most Popular Coffee Shop And Fast Food Chains? What Are The Most Common Symptoms And Effects Of Burn Injuries? What Should I Do If I Want To Make A Personal Injury Claim For A Burn Or Scald Injury? How Are Burn And Scald Injuries Assessed For Severity? You may have heard about a lot of stories that have involved people suffering burn injuries in coffee shops and restaurants. If you’ve experienced this, there is a very high chance you will be entitled to compensation. In this guide, we will reveal everything you need to know if you’ve experienced a hot coffee burn, a hot tea burn, or any other type of accident of this nature, including if you’ve been burned at work. We will reveal how much compensation you may get, as well as answering some other critical questions. This includes: How much can I claim for burns? How do you treat a hot tea burn? What is the coffee temperature law in the UK? And much more! How much is my burn claim worth? When making a personal injury claim, you will be able to claim general damages for any of the injuries you have sustained. Your doctor’s report, detailing your injuries and the severity of them, will be used to determine the payout. You will then receive compensation for any special damages, which means costs entailed, for example, travel costs, loss of earnings, and treatment expenses. According to the British Burns Association, there are around 250,000 individuals that experience burn injuries per annum in the UK. Out of these injuries, thermal injuries are the most common. Out of all thermal injuries, scalds are the most common. If you’ve been the victim of this type of accident, going to the hospital is always the first step. It is vital to get the correct treatment – both for your health and the case. Once this has been done, you can start to gather evidence. Photos of your burn can help to strengthen the case, as can receipts of any costs entailed and witness statements too. Have you experienced an injury caused by hot drinks burns in a fast food restaurant or cafe? No matter whether the drink was too hot or someone spilled it onto you, you will have the basis for a claim if the accident was not your fault. Give us a call today for more information. The most common hot drinks burn injuries are those that happen in restaurants and food establishments. This could be because you have been served a drink that is way too hot or because someone has spilled a drink on you. All employers have a duty to ensure that the working environment is a safe and healthy one. This is something they are obliged to do by law. However, unfortunately, this does not stop accidents from occurring. If you’ve been the victim of such an incident and you feel your employer is the entity to blame, read on to discover more. When it comes to any type of personal injury claim, the most important thing is to establish responsibility. You need to show that someone else has caused the hot drink accident causing scalds you have been involved in, which, in this case, will be your employer. There are various ways your employer may be responsible. Perhaps they have failed to carry out necessary risk assessments, maybe they have not provided the required employee training, or perhaps they have not supplied workers with the necessary Personal Protective Equipment (PPE) to protect their skin from burns. The reasons vary. Aside from showing that your employer is to blame, the other two aspects that need to be considered are the date of the accident and whether you received professional medical attention or not. In regards to the latter, you must see a doctor, even if your injuries are minor. If you don’t, you will not be able to claim because there will be no proof of your injury/ies. The date of the incident is also vital, and this is because there is typically a three-year time limit on all personal injury cases. If your injuries have developed over time, say you have developed complications because of the original burn, for instance, then you will have three years from the date of your diagnosis instead. There is no denying that slips, trips, and falls are the most common amongst all personal injury claims. If you’ve experienced a hot drink accident causing burns because of a fall or slip, we can help you to get the payout you deserve. This is so long as someone else is to blame and you did not injure yourself through slipping due to sheer clumsiness. Accidents often happen in public places because they are susceptible to heavy traffic, which increases the dangers. If you’ve slipped and injured yourself, and you believe that you are not to blame, then you will have a great chance of getting compensation. However, this all relies on determining who actually is to blame. In most instances, it is your City Council / Local Authority that will be responsible for the accident. This is because they are responsible for all of the roads, pavements and public spaces in the area, and, therefore, if these spaces are not safe or have not been maintained properly, they are responsible for your suffering. This may all sound quite confusing. How do you go forth with a claim from the City Council? Well, you don’t need to worry about that, as we take care of everything for you. Building a case – This will involve providing all of the details of the incident you have been involved in, as well as any evidence that can help to back up your claim, such as photographs of injuries or witness statements. The claim is logged – After we are content that the case is strong, we will then log it and the City Council’s legal team will assess it. Proposed compensation – Once the complaint has been assessed, the City Council will release their findings of the review, and they will propose a compensation amount. This is the general course of action, and it is extremely unlikely that you will have to go to trial. 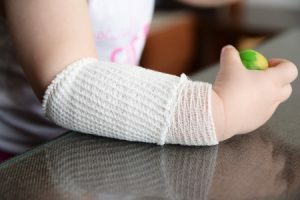 If your child has been injured because he or she has been burned or scalded by a hot drink, you will be able to claim compensation on their behalf within the specified time limit. This is something that you can do if they’re under 18. Once your child becomes an adult, i.e. turns 18, he or she will then have three years to claim from the date of their birthday. It is usually advisable that you claim for your child, though, as the details will be recent and it will be a lot easier for you to make a claim. In most cases, the payout will be put into an account that the child is unable to access until they turn 18-years-old. However, you may be able to access this fund to pay for matters like treatment and sometimes education. When it comes to determining how much compensation you will get, the severity of your injury/ies will be considered. However, it is not always easy to determine the impact a burn injury will have in the future, which is why it is so important to see a medical professional. Your doctor will pull together a report that outlines your injuries, ensuring you get the payout that you deserve. If you’ve not seen a medical professional, this is something that your solicitor will be happy to arrange for you. To make a claim if you’ve been scalded with a hot drink, all you need to do is give Advice.co.uk a call. We have years of experience in the industry, and we will help you to get compensation. We offer a free consultation, ensuring we get all of the information we need and that you can ask us any questions you have. If you require help with making a claim for first degree burns, second-degree burns, or any other type of injury, Advice.co.uk can assist. We have helped with a huge number of accident claims over the years. Therefore, read on to discover some crucial advice regarding what you should NOT do when making a case for compensation. Failing to see a doctor – A good number of people make the mistake of failing to see a medical professional, especially when they have only sustained a minor injury. They choose to cope with the injury themselves. However, if you do this, you will have no chance of making a claim, as you need proof of your injury/ies, which is what a doctor provides. Waiting too long to make a claim – The longer you wait to make a claim, the more difficult you will find it. Not only is there a strict three-year time limit on most personal injury claims, but also you will struggle to get your hands on critical pieces of evidence the longer you leave it, such as witness accounts. You may have also forgotten some of the important details about the car accident. Hiring a solicitor that charges by the hour – There is a lot of risk that is associated with going down this route, as there is always the chance that you are going to find yourself spending a large sum of money only for the case to be unsuccessful. This is why you are advised to look for a No Win, No Fee solicitor instead. Failing to keep proof of expenses – You need to keep proof of all the costs you have incurred because of your injury/ies, such as travel costs, treatment expenses, and loss of earnings. You will be able to claim for these, but only if you can prove the costs. No matter whether you have been involved in a slip, trip, or fall, or an incident because of a hot drink spill at a restaurant, one thing you will need is a high-quality personal injury solicitor that can give you the greatest chance of securing the full amount of compensation you deserve. However, a lot of people fear the huge costs that are typically associated with hiring a solicitor. Luckily, this is something you do not need to worry about with Advice.co.uk. This is because all of those solicitors we provide work to a No Win, No Fee payment agreement. Not only does this mean that you will not need to make a large payment upfront to begin the personal injury claim process, but it also means that you are only going to need to settle the legal fees where your case is a success, and so financial risk is minimised significantly. If you’ve been injured in an accident that was not your fault, you will recognise that you could be entitled to compensation. However, if you’ve never made a claim before, you may be a bit confused regarding how to go about the process. The first thing you always need to do is to make sure you find the best personal injury lawyer to handle your case. Keeping that in mind, here are some of the steps you should take, coupled with some of the reasons why we are great at providing solicitors that you can be sure will work hard for you. Look at their experience – One of the first things you should do is discover what experience they have in the industry. How long have they been working as a personal injury solicitor? Don’t only look at the years they have in their locker, but also discover what type of personal injury cases they have been working on. You want to discover whether they have experience in a case similar to yours, i.e. there is not really any point opting for a lawyer that is a specialist in workplace claims if you’ve been injured in a slip at a restaurant. Here at Advice.co.uk, we will provide a lawyer with years of specialist experience, ensuring you have an experienced person working on your claim. Read reviews – You should read reviews that have been given by previous clients; this is the best way to get an honest insight as to the level of quality you are to benefit from. If a solicitor doesn’t have the best reputation, let’s say they don’t communicate frequently and are impossible to get in touch with, this is something you should be able to pick up on with ease, as you can rest assured that there will be a wealth of negative reviews online. You certainly won’t find lots of negative reviews about our company. No Win, No Fee – Last but not least, it is highly advisable to go for a solicitor that is happy to work to a No Win, No Fee payment agreement. By doing this, you will only pay legal fees if your case is a success, which reduces monetary risk by a significant degree. It also means that you are likely to benefit from a much better service because the money the solicitor makes is dependent on the outcome of the case. If you’ve been injured in an accident that was not your fault, just ring Advice.co.uk today on 0161 696 9685. You can be speaking to one of our advisors within seconds who will gladly answer your questions about a hot drink accident, as well as getting you started with the claims process if you are ready to do so. There are plenty of other ways to get in touch with us too. For example, you can enter your details and we will call you back at the earliest possibility. Treating your burn or scald – Here’s some NHS advice on burns and scalds. Recovery from this type of injury – This covers what you should expect.